Share these Fathers Day poems in your greeting cards to Dad to wish him a Happy Fathers Day. Father's day is one that we recognize, acknowledge and thank our Dads. Fathers are people who play an important role in our lives. In North America it is celebrated on the third Sunday of June. Thanks for all you do, I love and appreciate YOU! He's always my first call. I want him to know first. He's the first one to hear me burst. How I am so very blessed. My dad makes me glee. If I need a helping hand. Love you Dad and wishes for your happiness! He believes in me cause he's my Dad. Because I am happy he is my Dad. The choice is always theirs. Or to stick around and care. And always did whats right. And never hugged too tight. But at least have this date. To me you're the greatest one. That I feel should be announced. And this should be undone. And Happy Father's Day to the Dads. Know you're loved and have made us glad. 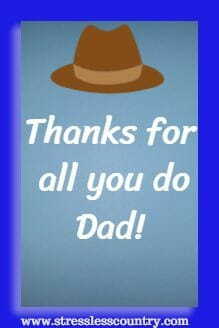 We need to say "Thanks Dad", not just on Father's Day but throughout the year. Being a parent is a wonderful experience but there are challenging times and there are rewarding times. Let your Dad know how much you love and appreciate him. Fathers Day Poems From Daughter - daughter and fathers have a special relationship, let these poems written by a daughter help express your thoughts to your Father on this special day. 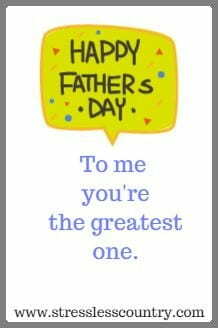 11 Short Fathers Day Poems - short poems, to share; ones expressing respect and fondness of the man we cherish and treasure, our Dad. Step Dad Poems - For that special man, your step-dad. Being a step-father is not an easy task. But they grow to love their step-children as their own. The relationship is different but there is still a close attachment and relationship to this man. Fathers Day Inspirational Poems - Let these inspirational poems say thank you to your father or to someone who has made a positive difference in your life. Father Quotes Short quotes about fathers to share, inspire and encourage.